St Johns Park Bowling Club is proud to continue their generous support of education and sport within the local community. Roger Davis, Principal, Westfields Sports High School, is overwhelmed by the ongoing generosity of the club. A grateful Mr Davis remarked, “St Johns Park Bowling Club has been one of our utmost supporters over the years. 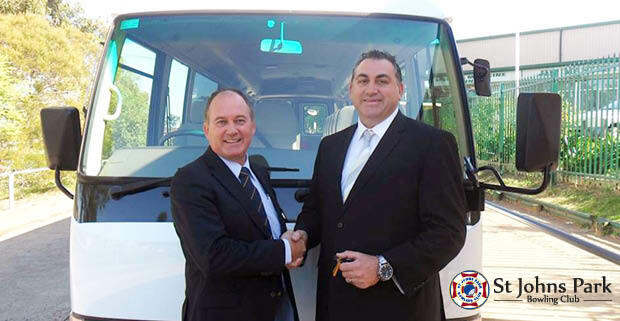 Not only have they donated $64,000 over a four year period for our school bus, the club has also assisted with a number of welfare based and literacy programs supporting student leadership and children at risk”. The bus is used by the school to transport students to sporting and community events. St Johns Park Bowling Club CEO, David Marsh said “We are pleased that we are able to offer financial assistance to the community, including many of our local schools, and have every intention of continuing our support in the future. That is what clubs are all about”.